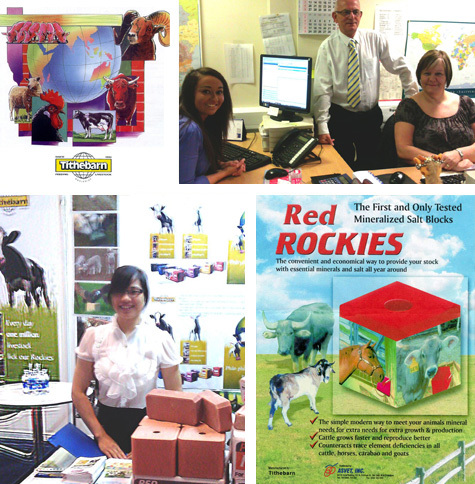 Founded in 1935, Tithebarn is a specialist producer of livestock feed supplements and Rockies were among its earliest and most immediately successful products. Rockies are now sold in over 50 countries. Tithebarn is fortunate to be based in Cheshire, where its manufacturing facility stands literally on top of the UK’s purest and most productive salt field. Salt extracted from deep beneath Cheshire pasture land has been valued for its purity since Roman times, it can be refined to 99.9% purity. We receive bulk deliveries within three hours of extraction. Close proximity to its salt source also means that every Rockie is made from extremely fresh salt and is manufactured within three hours of extraction. Farm tests prove that animals detect and appreciate the extra ‘tang’ of fresh salt – a factor that significantly improves the effectiveness of Rockies as a supplement carrier. Tithebarn’s global success stems in large part from its insistence on selling only products based on proven science and manufactured to the highest quality. It invests heavily in continuous research and development and farm testing. This provides a wealth of data to help farmers and livestock owners forecast the outcomes of using any Rockies product before buying. When many farm costs can be unpredictable, it makes a welcome change to be able to calculate the cost effectiveness of Rockies and the contribution they make to farm profit. Tithebarn’s operating principles are simple, and unchanged since 1935. Tithebarn products, services and advice are of the highest quality, and its top priority is the health of animals and the financial wellbeing of their owners. That’s why the Rockies product range has been trusted for so long by farmers worldwide.